This handbook provides the only complete collection of high-pressure thermodynamic data pertaining to polymer solutions at elevated pressures to date of all critical data for understanding the physical nature of these mixtures and applicable to a number of industrial and laboratory processes in polymer science, physical chemistry, chemical engineering, and biotechnology. 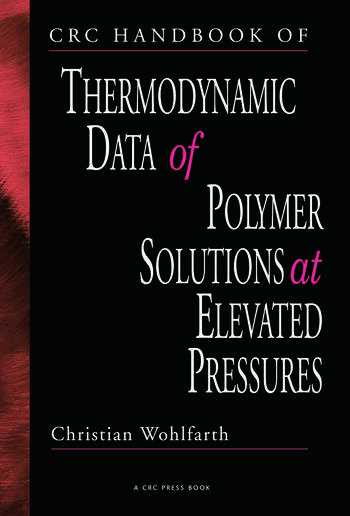 In response to the increasing commercial interest due to the physico-chemical properties of these solutions, the CRC Handbook of Thermodynamic Data of Polymer Solutions at Elevated Pressures compiles information on experimental data from hundreds of primary journal articles, dissertations, and other papers into a single source entirely devoted to polymer solutions. The book contains data on vapor-liquid equilibria and gas solubilities, liquidâ€“liquid equilibria, high-pressure fluid phase equilibria for polymer systems in supercritical fluids, enthalpic and volumetric data, and second virial coefficients, all at elevated pressures. 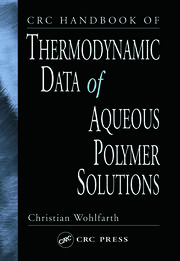 An excellent companion to the author’s previous publications, the CRC Handbook of Thermodynamic Data of Copolymer Solutions and the CRC Handbook of Thermodynamic Data of Aqueous Polymer Solutions, this handbook contains reliable, easy-to-use entries, references, tables, examples, and appendices that provide students, professors, and researchers with a well-organized, quick route to the data they need. 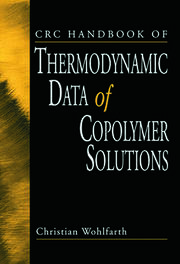 The CRC Handbook of Thermodynamic Data of Polymer Solutions at Elevated Pressures is a staple resource for all university libraries as well as private laboratories, particularly for researchers, academics, and engineers who handle polymer systems in supercritical fluids, material science applications such as computerized predictive packages, and chemical and biochemical processes, such as synthesis and characterization, fractionation, separation, purification, and finishing of polymers and related materials.